For further information please click anywhere on the image. This Operational Qualification (OQ) protocol comes with an interactive standard operating practice (SOP) document as a prefixed introductory document. As you progress through this SOP you are auto populating the OQ. This is a really easy and straight forward document to use. In the preparation of Operational validation protocols, it is important to allow a certain degree of flexibility. This must be debated and justified in the Validation Plan (VP). Should the OQ remain untouchable, until the Installation-Qualification (IQ) is completed and signed off? There are many instances where this is not only undesirable, but senseless and deleterious to project progress and costs. Should every function in a system or piece of equipment be qualified? If so, one must ask about validation progress and costings. It makes little sense to fail something for not reaching a parameter that you are not going to use. The Operational Qualification includes a review of the Standard Operating Practice (SOP's) for start-up, operational, maintenance, safety, and cleaning / sanitization. The modular process has been followed in constructing this Operational Qualification, in as much that where tests / inspections are standard for systems and or equipment, they are built into the basic protocol. Where they are not they are available as additional test protocols. Functional and software tests are authored in this stand alone test scrip protocol format. When the OQ is being raised they are pasted in. The document format will paginate them, and automatically add them to the ‘Table of Contents’. They are then part of the OQ. These Test Scripts can be held as Method Statements or SOP's. This allows the generation of a standard OQ that covers all the many items the regulators are looking for, with the facility to have integrated into it, the equipment specific testing tasks. It also means that these stand alone test scripts are available for tasks other than validation, i.e. when system re-testing is required. It also saves unnecessary testing and re-testing. For example, when a room pressure regime has been commissioned by another party and the completed report is in date and available, is it practical and legal to use it? There is no reason why not, providing it has been authored, and executed using the same documentation practices and procedures as are used in the routine production and execution of validation protocols. The OQ test scrip will be of standard format, the contractors tests (containing the raw data) will be reviewed and data extracted from it. This data will be used to verify that the Operation Qualification test script acceptance criteria has or has not Operational Qualification Rationale.been satisfied. The raw data from the contractor now forms part of the OQ, and must be appended to it permanently, along with copy calibration certificates for all the test equipment used in obtaining the raw data. Insert a brief description of the operational function. Testing to verify and document 'Power loss Recovery'. This document follows our well-developed method of using a generic document and allowing the customer to apply an attached detailed SOP to it, turning the generic document quickly into a first class company bespoke document. This VP details and integrates all validation activities and procedures required for a small to medium sized project, involving production / facility / utility equipment using electronic controls or monitoring. The document that sets the standard and specifies your requirements in a manner that ensures when a system or piece of equipment is selected, it will deliver the functions you want; i.e. it will have maintenance standards and methodologies; it will have calibration records; it will have all the documents and records to enable successful validation to be completed. This document was designed to be used as a live document up until the DQ is completed and approved. It uses three levels of URS, URS Level 1, 2 and 3, and is the only URS to guarantee traceability from the URS through to the final PQ and OQ functionality testing. 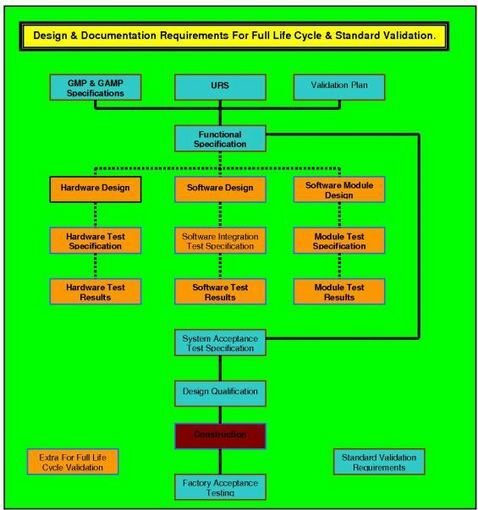 This is a mandatory requirement for Full Life Cycle Validation (FLCV) of computer systems that are the subject of predicate rules. It can be used on mechanical, electrical and software controlled, monitored or managed systems. The SOP used to generate this IQ, takes you through the process line by line, chapter by chapter. It really is unique to find a SOP document so easy to use, all the work is done for you. All the documents are detailed, all the drawings listed and all the checks and tests detailed. The final product is a professional and comprehensive Installation Qualification Protocol: One that you can produce in less than 60 minutes. Yes, think about it, we all know how long producing IQ documents has taken in the past. There is now no reason for not being able to produce 4 to 8, IQ protocols per 8 hour day. You will find the step by step attached SOP delightfully simple and straightforward to use, as it takes you through the process of customization of your Operational Qualification Protocol template. Following the attached SOP will quickly and smoothly convert your template into an equipment specific Operational Qualification Protocol. The OQ template comes complete with all the standard test scripts, more specialist test scripts can be found listed below. These can easily be pasted into the standard OQ, allowing you to quickly build your own fully detailed and referenced company bespoke Operational Qualification Protocol. Template for VMP.